This is the most frequently-asked question in all of ziplining. The short answer is YES! 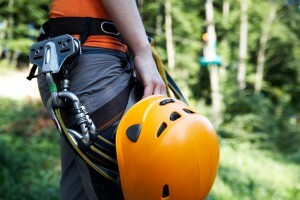 Commercial ziplines are very safe—statistically much safer than most of the outdoor activities that children play. You might note that we say commercial ziplines above. That’s because some people build private ziplines in their backyards. These homemade ziplines are the ones you should be avoid. Backyard ziplines are responsible for most of the zipline injuries that you read about. When it comes to zipline safety stick with commercial ziplines. 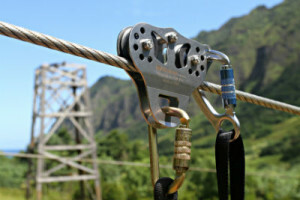 At OahuZipline.com, we do not promote or encourage the use of backyard ziplines. We only promote ziplines that are either ACCT- or ASTM- approved. That means that the regulating bodies in the industry have tested and approved the ziplines for safety. This is important, and you should only zip on lines that have this approval. You might be thinking, “Wait, there were deaths on the commercial ziplines in Hawai‘i.” You are correct. There was a death on Hawaii Island, and one on Maui. There have been no deaths on Oahu ziplines. It is also important to note that the deaths were zipline employees and not participants. Statistically, you are in more danger when riding in a car or playing golf. Perhaps you are concerned with the equipment used. 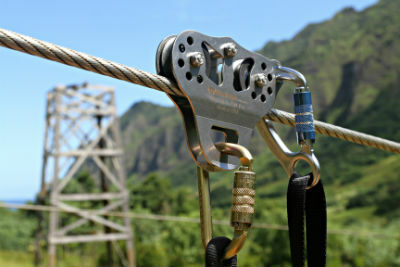 Fortunately, on Oahu all of the ziplines utilize excellent safety equipment beyond the requirements of ACCT. They all have a dual braking system and do not require participants to brake with gloves or otherwise. Riders are given a helmet and a harness. Tours are operated by experienced guides in small groups. The guides check the equipment before each tour. Still not convinced about zipline safety? Go to a zipline and watch the precautions that the operators take to make sure that the zipline is safe. We are lucky on O‘ahu to have very safe and trusted zipline operators. You can be sure that whether you choose the Kaneohe Zipline, Kualoa Ranch Zipline, or the North Shore Zipline Tour, they will adhere to the top safety standards.